Sub: Seventh Central Pay Commissions recommendations – revision of pay scales – amendment of Service Rules/Recruitment Rules. 2. 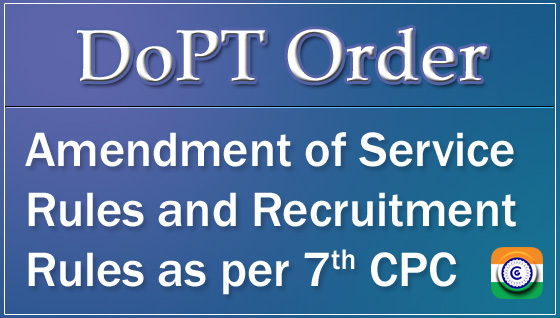 In the light of above all cadre controlling authorities of Organized Group A services are hereby requested to amend the SRs as per OM dated 30.08.2016 to bring them inconformity with 7th CPC structure. The information in this regard may also be furnished to the undersigned latest by 31st July 2018 in the format enclosed.